The Gangotri Group of mountains lie in a subdivision of the Garhwal Himalaya in the northern Indian state of Uttarakhand. They form the outer ring of the Gangotri Glacier, and are approached from the Rudugaira Bamak (Glacier) and stand next to one another at the height of – Gangotri – I (6672m), Gangotri – II (6590m) and Gangotri – III (6577m). This is an impressive amphitheatre of high mountains encircling the Rudugaira Glacier, with giants like Jaonli, Jogin and by the very impressive Auden’s Col which is our exit out into the Bhilangana valley. Gangotri I, the highest peak of the valley, was first climbed by an Oxford University Expedition in 1952. Ascent was made by J. 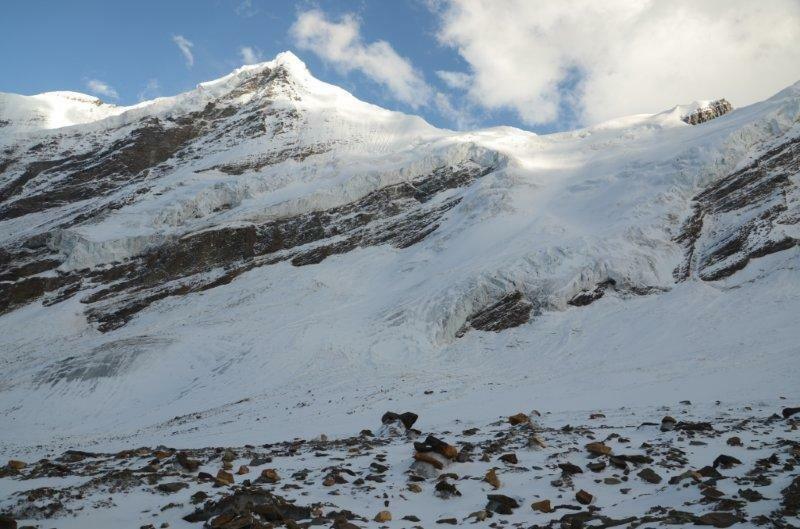 B. Tyson, Huggins, Pasang Dawa Lama, Govardan and Annullu on 02 October, from the northeast ridge. 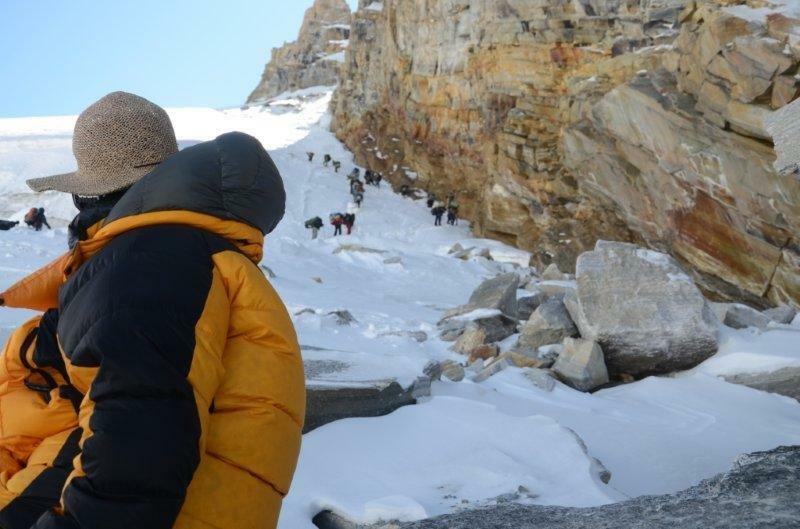 Three members of the same expedition namely Lamprey, Tyson and Annullu reached the summit of Gangotri III (6577 m) after a 9 hour gruelling ascent, also from the northeast ridge of the mountain. In 1969, the Nehru Institute of Mountaineering (NIM), Uttarkashi moved into the valley and conducted its first Basic and Advance Mountaineering course in the area. Ever since then, NIM has been using the Rudugaira bamak, off and on for its training courses. 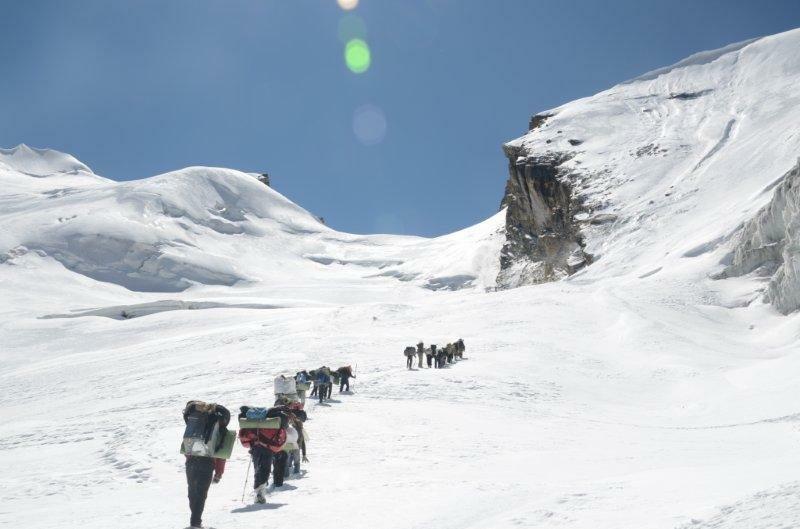 Gangotri III was climbed by the 14 Advance Mountaineering Course (Major Surat Singh) on 27 June 1969. Ever since then, over the years these peaks have been reportedly climbed by a number of expeditions of both Indian and foreign origin. Dominating the Rudra valley amphitheatre, are peaks of the Gangotri group. Although not of a very spectacular elevation, the shapely Gangotri group covers the sky line for almost 6.5 km. From Gangotri I (6672 m), the north west ridges continues in the form of a serrated ridge line for almost 7 km to Srikanta (6133 m), which towers above the Dudu Bamak. The north east from Gangotri I ridge drops down to a prominent col and then rises on to Rudugaira peak (5819 m), which is a popular landmark in the valley. The ridge further continues unabated for 9 km, as the Rudugaira dhar and merges with the valley floor at the confluence of Bhagirathi and Rudra Ganga. To the North West lies the picturesque Miyana valley. The southeast ridge emanates from Gangotri I and cuts across to Gangotri II (6590 m) and Gangotri III (6577 m). Further the ridge moves east and south east and encloses the valley, merging with Jogin I (6465 m) of the Jogin group. The north ridge emanates very prominently from Jogin I and cuts across to Jogin II (6343 m) and continues onwards as the Patangana dhar. It is the 12 kms long Patangana dhar, which separates the Kedar Ganga from the Rudra Ganga valley. It also encloses the Rudra Ganga from the east and finally peters away at Gangotri between the confluences of Kedar Ganga and Rudra Ganga with the Bhagirathi. The Auden’s Col (5486 mtrs) (Col – the lowest point of a ridge or saddle between two peaks, typically providing a pass from one side of a mountain range to another), situated on the connecting ridge of Gangotri III (6577m) on the north west and Jogin I (6465 m) on the east, is a small depression between the two mighty massifs. The pass is named after John Bicknell Auden, a British Geographical Survey officer, who first discovered it in 1935 and crossed it in 1939. The approach to the Col is from the Rudugaira glacier and the descent through the ice falls and the heavily crevassed Khatling glacier. The expedition commences by driving up the Bhagirathi valley right till the end of the road at Gangotri. 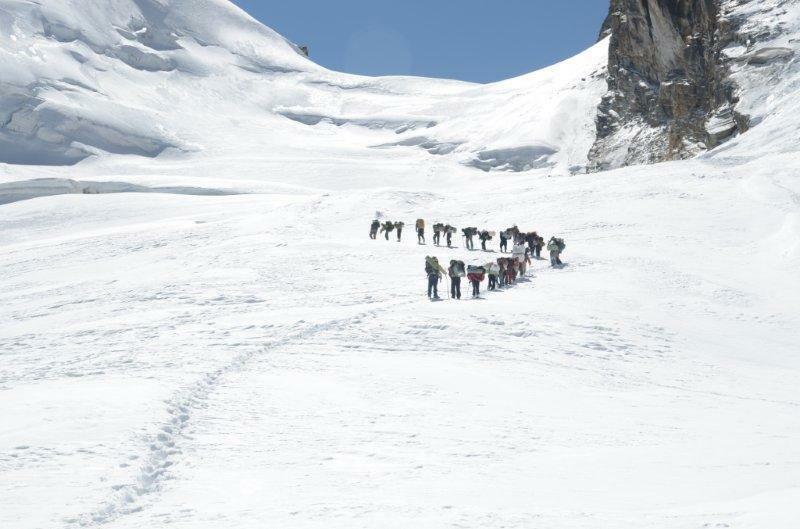 From here we move south towards the Gangotri range establishing a series of camps. 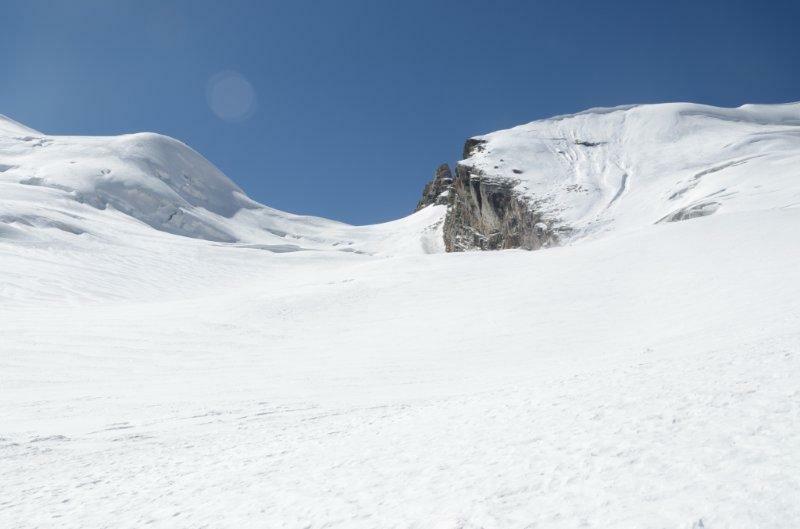 With proper acclimatization, we cross the col and abseil to the mighty Khatling glacier. We descend the Khatling glacier and exit along the Bhilangana River, which surges from the mouth of the Khatling. This is one of the most scenic walks in the Indian Himalayas, all the way till Reeh, where the road has moved up the valley. It’s a challenging trek and meant for those who want a bit more than the ordinary and the expected. Arrive Hardwar by overnight / day train. Board waiting vehicles to be driven straight to Kuflon Basics in the Assi Ganga valley (7hrs). Breakfast enroute. Overnight Kuflon. After breakfast, depart Kuflon for a 4 hr drive to Gangotri. This small town is centered around a temple of the goddess Ganga, and the impressive falls of the Bhagirathi at Gauri Kund. Gangotri was built by the Nepalese General, Amar Singh Thapa in the early 18th century. The aarti ceremony at the Gangotri is a must – see. Overnight at the guest house at Gangotri (3050m). Walk on the trail leading to the lake of Kedartal. The trail goes through birch forests and is steep all the way to the small campsite at Bhoj Kharak (3780m). Back to Gangotri by late afternoon. Overnight at the guest house at Gangotri (3050m). Set off on the true left of the Bhagirathi River and walk for about half an hour before we turn south towards the Rudragaira Nalla. Looking back we get beautiful views of Chirbas Parbat, Matri, Yogeshwar and the other snow-capped mountains. The climb is a gradual uphill through the forests of birch and maple. Nalla Camp is just above the tree line and can get quite chilly during the night. 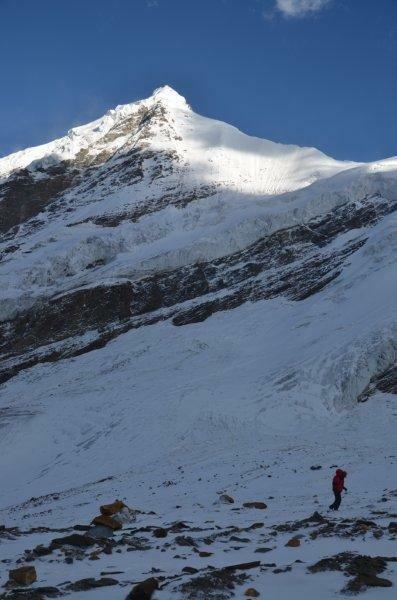 Overnight at the Nalla Camp (3760m). Steep climb to a huge meadow followed by a river crossing and another steep climb right up to the Rudragaira Base Camp. After lunch at the grassy campsite continue over the glacial moraine to the Gangotri 1 Base Camp. Overnight at the Gangotri 1 Base Camp (4500m). Proceed towards the head of the valley with the Gangotri Range to the north and Jogin group to the south. Auden’s Col is at the head of the valley in the depression between the two massifs. Camp at the foot of the col. Overnight Auden’s Col Base Camp (4800m). Climb to the col in the firmer morning snow. 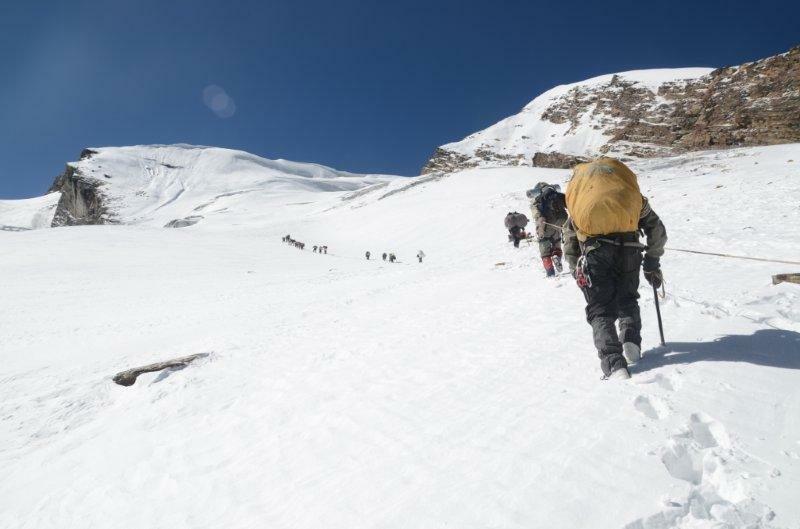 The climb is steep and can easily take 4-6 hrs depending on the snow conditions. Auden’s Col offers excellent views of the Khatling Glacier, and the mountain peaks of Jaonli, Kedarnath, Jogin & Gangotri. From the col we abseil down near-vertical walls of ice on fixed ropes to the heavily crevassed Khatling Glacier. Overnight Khatling Glacier Camp (5110m). One of the best days of the trek. Get surrounded by high mountains massifs, with small glaciers feeding the main trunk of the Khatling glacier. Descend towards the snout of the Khatling, negotiating crevasses along the way. The group will be roped up for overall safety. Overnight Khatling Glacier Camp (4210m). Descend through the moraine to get to the snout of the Khatling Glacier, from the mouth of which emerges the Bhilangana river, a tributary of the Bhagirathi which meets it at the Tehri dam. Camp on the true right of the river near a natural cave. Overnight Camp Khatling Cave /Tambakund (3400m). Walk through dense mixed Himalayan Forests of oak, birch, deodar, fir & rhododendron. The gradient is gradual and this walk in the woods gives a great opportunity to commune with nature. People are allowed to enjoy the walk at their own pace and the guides spread out a bit. Kharsoli has a beautiful campsite in a clearing next to a gushing stream. It’s hard to resist the temptation of jumping into the stream. Enjoy a big campfire in the evening. 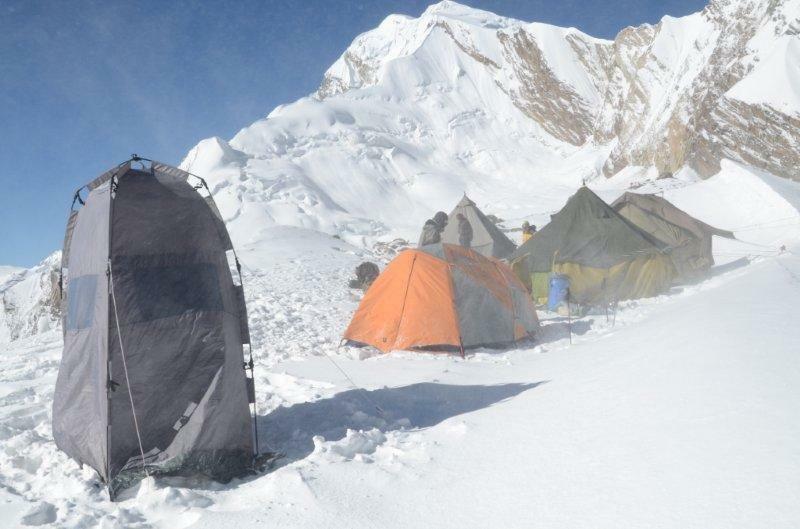 Overnight Kharsoli Camp (2880m). Continues through dense forest, shepherd hutments and reach the first signs of civilisation. Overnight Camp / GMVN Guest House at Gangi (2650m). Descend to the pine forests and go past the village of Reeh to finish the trek at the road head, 4kms upstream of Ghuttu. Overnight Camp / GMVN Guest House at Ghuttu (1550m). Relaxed start, pack up, drive from Ghuttu to Haridwar and board the evening Shatabdi Express to be back in Delhi by 10:45pm. Note: Days highlighted in both itineraries are common, when both teams climb together to the Auden’s Col.